friction against the side of the opening, as the puff of smoke passes ont, produces a rotary motion, and the result will be smoke rings or vortices. 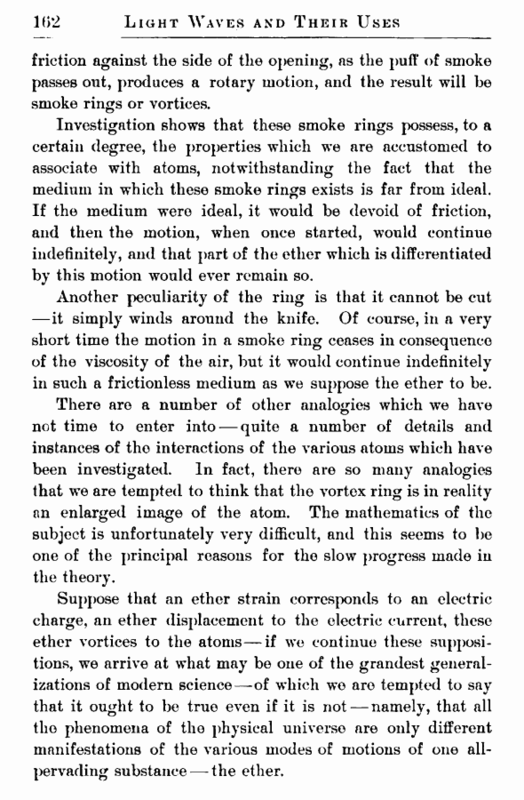 Investigation shows that these smoke rings possess, to a certain degree, the properties which we are accustomed to associate with atoms, notwithstanding the fact that the medium in which these smoke rings exists is far from ideal. If the medium were ideal, it would be devoid of friction, and then the motion, when once started, would continue indefinitely, and that part of the ether which is differentiated by this motion would ever remain so. Another peculiarity of the ring is that it cannot be cut —it simply winds around the knife. Of course, in a very short time the motion in a smoke ring ceases in consequence of the viscosity of the air, but it would continue indefinitely in such a frictionless medium as we suppose the ether to be. There are a number of other analogies which we have not time to enter into — quite a number of details and instances of the interactions of the various atoms which have been investigated. In fact, there are so many analogies that we are tempted to think that the vortex ring is in reality an enlarged image of the atom. The mathematics of the subject is unfortunately very difficult, and this seems to be one of the principal reasons for the slow progress made in the theory. Suppose that an ether strain corresponds to an electric charge, an ether displacement to the electric current, these ether vortices to the atoms—if we continue these suppositions, we arrive at what may be one of the grandest generalizations of modern science—-of which wo are tempted to say that it ought to be true even if it is not — namely, that all the phenomena of the physical universe are only different manifestations of the various modes of motions of one all-pervading substance — the ether. All modern investigation tends toward the elucidation of this problem, and the day seems not far distant when the converging lines from many apparently remote regions of thought will meet on this common ground. Then the nature of the atoms, and the forces called into play in their chemical union; the interactions between these atoms and the non-differentiated ether as manifested in the phenomena of light and electricity; the structures of the molecules and molecular systems of which the atoms are the units; the explanation of cohesion, elasticity, and gravitation — all these will be marshaled into a single compact and consistent body of scientific knowledge. 1. A number of independent courses of reasoning lead to the conclusion that the medium which propagates light waves is not an ordinary form of matter. Little as we know about it, we may say that our ignorance of ordinary matter is still greater. 2. In all probability, it not only exists where ordinary matter does not, but it also permeates all forms of matter. 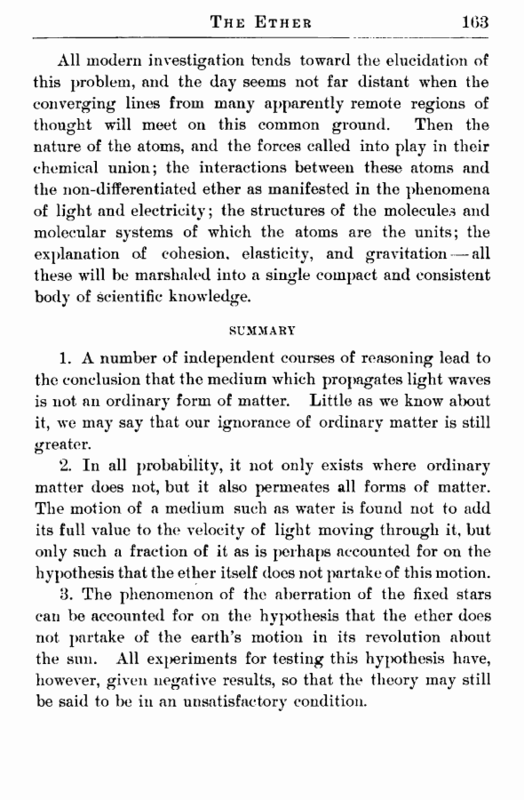 The motion of a medium such as water is found not to add its full value to the velocity of light moving through it, but only such a fraction of it as is perhaps accounted for on the hypothesis that the ether itself does not partake of this motion. 3. The phenomenon of the aberration of the fixed stars can be accounted for on the hypothesis that the ether does not partake of the earth's motion in its revolution about the sun. All experiments for testing this hypothesis have, however, given negative results, so that the theory may still be said to be in an unsatisfactory condition.